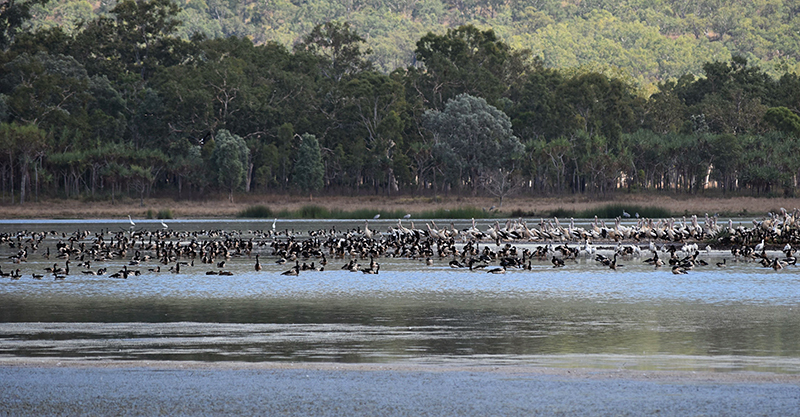 Spotlight on outstanding Lower Burdekin wetlands. World Wetlands Day on Saturday 2 February is a time to celebrate the importance of wetlands for our people and planet, as well as their natural beauty. Wetlands are home to a dazzling array of native wildlife, but they also protect coastlines from extreme weather, support recreational and commercial fishing, and act as a natural water quality treatment system by filtering sediments and nutrients before they can impact downstream environments. Wetlands and Climate Change is this year’s theme, with a particular focus on their ability to naturally absorb and store carbon at a higher rate than forests. NQ Dry Tropics’ Waterways Wetlands and Coasts Program Manager Laura Dunstan said that the Lower Burdekin region was home to outstanding wetlands, some of which were recognised internationally. “Wetlands such as those at Bowling Green Bay, Horseshoe Lagoon, Sheepstation Creek, and Wongaloo are a haven for native and migratory birds”, Ms Dunstan said. “These beauty spots on our doorstep are there to be enjoyed, and anyone wanting to learn more about these habitats should head to Pallarenda in Townsville on Saturday 2 February for a World Wetlands Day celebration”, she said. Ms Dunstan also said that her team worked closely with a range of local partners on several projects to help maintain and restore Lower Burdekin wetlands so they can continue to benefit wildlife and local communities. “For example, Reducing Burdekin Sediment is a new project funded under the Queensland Government Natural Resources Investment Program. “We will be working on four priority wetlands together with local landowners, Burdekin Shire Council, Burdekin Shire Rivers Improvement Trust, Lower Burdekin Water, Lower Burdekin Landcare, Gudjuda Reference Group, JCU TropWATER and the Burdekin Bowen Integrated Floodplain Management Advisory Committee (BBIFMAC), she said. “Activities will include removing targeted aquatic and riparian weeds, removing sediment, improving flow regulation, revegetating creek banks, and supporting upstream cane growers to minimise impacts on wetlands by improving farm management.